Showcase your aromatic scents in any of SKS' top five perfume containers! These high-end clear glass perfume bottles feature high clarity to show off products, such as perfume oils and solid perfume palettes in toiletry sets, perfume sample mailers, body care product lines, and more. Clear glass perfume sample vials have a slender shape and come in multiple styles to fit your cosmetic packaging needs. Choose from natural or black PET stoppers, with or without applicators, in either 41 mm or 65 mm sizes. Read our glass vial product spotlight for more info on the construction of these perfume sample vials. 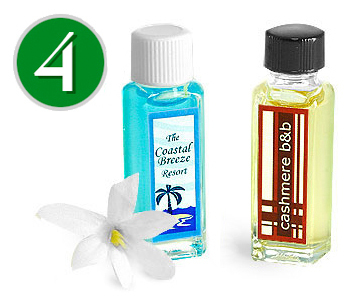 Use these small perfume vials to add your aromatic scents to sample mailers, tester sets, and travel kits. 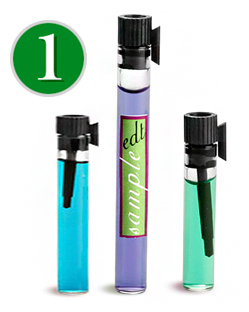 For an atomizing dispensing option, choose from clear glass vials with natural sprayers in three convenient sizes. The small glass vials house the perfect amount of product for traveling or sampling, and can easily be refilled from larger containers when empty. 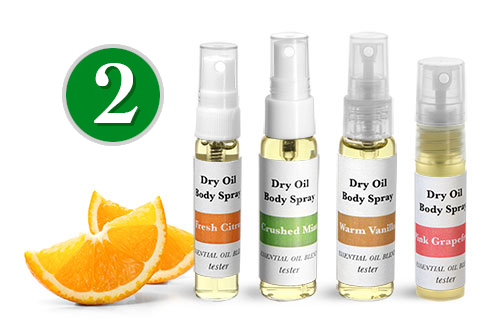 The natural fine mist sprayers include clear overcaps to reduce unwanted discharge while storing in purses and cosmetic bags. 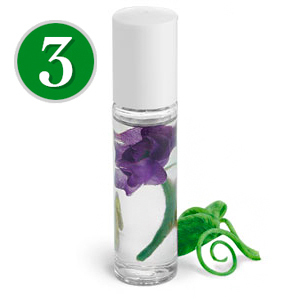 SKS offers a large range of roll on containers that make excellent smooth perfume applicators. Clear glass roll on containers come with black, white, silver, or gold caps to match your desired style. For a touch of color, choose frosted glass roll on containers with various cap color options. Rich colored amber, purple, and bronze bottle options are also available. Browse our product spotlight to see all of our creative perfume packaging ideas. Clear glass square perfume bottles paired with black bulb glass droppers offer a high end packaging option for perfume oils. Droplets of oil or perfume are precisely dispensed one at a time when the dropper bulb is squeezed. Pair these glass bottles with black plastic caps for an eye-catching look. The square design offers an easier grip and features flat panels for labeling options. To easily and stylishly package solid perfumes, choose clear glass thick wall jars with black smooth caps. These luxurious glass jars are available in various capacities with wide openings, and their thick walls and bases provide increased durability. Be sure to read our product spotlight for a full range of glass cosmetic jar options and to view additional features.